We’re starting off this year’s 12 Months of Birding at the Inn — a monthly showcase of different bird species seen at the Inn on Mill Creek — with the big and beautiful Blue Jay. The Blue Jay is considered a year-round resident in our neck of the woods near Black Mountain, NC, but we don’t see them very often, so it’s special when they do make themselves known. They tend to prefer the edge of the woods and the Inn on Mill Creek is located two miles within Pisgah National Forest, so we assume that we’re not really Blue Jay territory, even though we’re surrounded by oak trees and Blue Jays love acorns. Blue Jays also migrate (estimates are that fewer than 20% of Blue Jays migrate), but according to the Cornell Lab of Ornithology, they have a mysterious migration pattern. For example a Blue Jay may migrate south one year and then migrate north or stay put the next year. 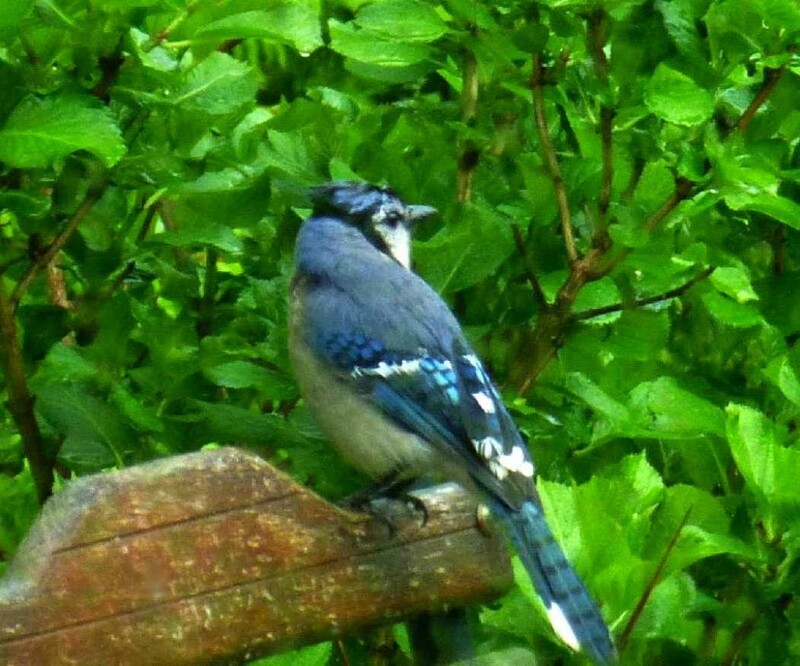 The Blue Jay is an easy bird to spot when you do happen to see one at the Inn. Blue, black, white and gray are their primary colors (white/light gray undersides and black and various blues on their backs and wings). They also have a mohawk-like crest, similar to the Northern Cardinal and the Tufted Titmouse. Interestingly, the Blue Jay’s “blue” feathers are actually brown like the Indigo Bunting and the blue coloring is a function of light scattering through modified cells on the feather barbs’ surfaces. Blue Jays are not only easy to identify, but they are easy to hear and can be quite noisy. We like to say their volume control is stuck on “loud.” In addition, the Cornell Lab of Ornithology notes that Blue Jays have an “immense vocabulary” and can mimic Red-tailed Hawks Red-shouldered Hawks and other species. If you are at the Inn on Mill Creek, whether as a guest or as a visitor checking out birds on the North Carolina Birding Trail (we’re a site in the trail’s Mountains region), definitely let us know. And stay tuned to the blog this year to see what birds we’ll be featuring.